Ever since the Bomberman inception in 1983, it has been released a number of times with many variations. The latest Bomberman online Android version is a pure delight for gamers looking to carry the Bomberman version with them 24×7. With the new Android version, you can play the game with random opponents or play the multiplayer with friends. The Bomberman online is a clone of the classic game. You can play this in multiplayer mode through Bluetooth, 3G or Wi-Fi connectivity. Arcade Mode: This is basically a rehashed version of the classic Bomberman game. You can lay bombs, avoid the bad guys, and complete the small achievement list. Then when the levels are completed, you get upgrade points, giving you an advantage over the opponents. 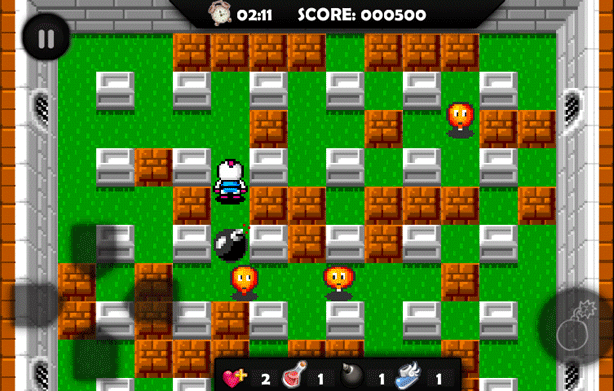 The Arcade Bomberman online mode has 8 challenging levels. Of course, the makers will keep on adding levels as it becomes more popular. Nevertheless, till that happens, you will be amply occupied completing the 8 challenge levels. Multiplayer Mode: This Bomberman online mode is definitely a unique avatar of Bomberman but it still needs a lot of work to bring finesse. Unless you are acquainted with how Bomberman works, it will be a tad difficult to understand the Bomberman online Multiplayer version. Otherwise, you can read the developer’s setup guide. To play the Bomberman Online multiplayer version, set up the screen, then choose between Bluetooth and Wi-Fi connection. If you choose a public match, the setup will automatically choose the 3G connection, otherwise you need to choose the private mach if you want to play with Wi-Fi or Bluetooth connection. If you have solid Wi-Fi connection, play the private matches by all means. Catch the Flag and the Deathmatch are the two multiplayer games available. Conclusion: The Bomberman online has been out for few weeks only and their developer says, game has to developed further to give users a glitch-free multiplayer action. Download and install the Bomberman Online from Android Market or use the attached QR code to get it. Do let us know what do you think about this Android game.